Hill Phoenix Inc., founded back in 1887 manufactures commercial refrigeration and grocery display units. Based in Conyers, Georgia the company has a variety of CNC punch and laser machines across two sites, with The Aquila’s Group’s DMM software passing orders for nesting to their CAM software. Their previous system could not automatically common cut on punching machines, had inferior tool management which created programs that either needed manual interaction or were unable to run altogether. It also had no teach mode and material efficiency was poor, which was the major driving factor to look at alternative systems. Interroll reduces material waste and saves programming/nesting time on their Hankwang laser. Interroll use AutoDesk Inventor and are currently testing automation to dynamically import native Inventor files to JETCAM, with tooling being applied automatically during the import process. Once completed Stephen cites that this will reduce man-hours by a further 30 minutes per day. Liebert’s four plants operate several variants of laser shearing and punching systems, and Jetcam makes programming, nesting, and process optimization simple and efficient across the network. Liebert Corporation manufactures air- and power-conditioning systems for computers and server rooms at three plants in Ohio, as well as a fourth in Mexico. The Emerson Electric division purchased its first Finn-Power Shear Genius right angle shearing and punching system in 1997, an installation that had Jetcam Expert CAM software installed by the vendor. Senior manufacturing engineer Alan Mauerman explained that, “the previous CAM software was simply not designed to support right-angle shearing, and was barely acceptable for creating basic X and Y g-code for machines like our standalone Amada turret punch press. It was slow to use, often displaying unexplained errors and suffered from problems importing DXF files. Since Liebert adopted Jetcam it has expanded significantly, and upgraded its CNC machinery across several plants. The operation in Columbus, Ohio has six Shear Genius machines, five that are CNC punch operations, and one performing a punch/laser combination. All six have material loading robots, and most also are benefiting from right angle shearing. One of these is link to an Express Bender machine. In fact, Jetcam drives 14 turret machines across Liebert’s plants in Columbus, Delaware, and, Ironton, Ohio, and Mexicali, Mexico. CAD import routines had been a problem for the previous CAM software, but Jetcam's automatic “healing” routines ensure that any “unhealthy” files can be cleaned up (“healed”) automatically using pre-defined parameters. Complete directories of CAD files can be healed, imported and tooled automatically using Jetcam's Single Component Automatic Processing (SCAP) function. Then, they are immediately ready for nesting. Moving forward Liebert and its staff have gained continuing benefits thanks to Jetcam's ease of use. They had a number of new users who had extensive shop-floor knowledge, but little computer experience. In less than a week, according to Mauerman, they had gained the confidence and skill to produce highly optimized nests. As the price of raw materials continues to rise, Liebert has engaged Jetcam to help it derive further savings. The company purchased Jetcam's high-performance nesting module, which has delivered savings on materials ranging from 5% to 13% by continuing to try different nest patterns over a specified size range. The software also includes functions like common line cutting and remnant sheet management that allow every possible square inch of material to be used, or saved for reuse where possible. 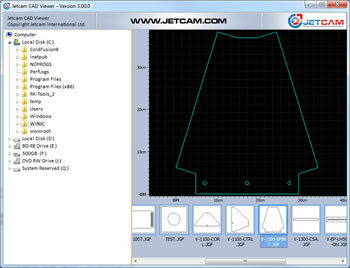 Jetcam developed a separate application using its Remote Control Processing (RCP) system to compare previous sheet sizes versus several options for new sizes. It uses the component file for each part, monthly part usage, and current sheet dimensions. Other information, like material cost, part spacing, trim width, sheet increments, and minimum/maximum size ranges, also were selected. Then, RCP automatically nests each part on all of the different sheet sizes, which takes an average 3 seconds per nest to compute. A spreadsheet is generated that compares the current cost and provides three recommended sizes based on the best weighted-average material cost savings. “I've used RCP to analyze over 15,000 combinations of sheet sizes for just one material type. I simply could not have done that manually,” Mauerman noted. Liebert has been using Jetcam for over 15 years, at four locations and covering many types and models of NC punching equipment. “In the past our sheet utilization was around 68-72%, but now with the RCP method coupled with high-performance nesting we have seen increases up to 13%,” he concluded. Balingen, Germany - The 100-year-old Walter Götz GmbH, with more than 100 employees, provides subcontract services producing semi, fully finished metal products for prototypes and small/medium sized production runs. To do this, the company has continually purchased and upgraded a wide range of CNC cutting machines, employing a mix of laser, waterjet, punching and combination punch/laser technologies spanning several manufacturer brands. In the mid 1990s,Stefan Burghard, managing director, discovered that programming the machines was becoming a bottleneck within the business, with three different CAD/CAM systems in use programming the machines. This was a problem when, for example, a new job had to be re-programmed for another machine if a machine was unavailable due to workload or maintenance. In addition, it took a long time for the staff to learn to use all three systems. If a programmer was away some production areas would stagnate because other programmers would, again, need training time on the respective software. In the attempt to commit to a single CAD/CAM system it quickly became clear that it was simply not possible to use the software supplied with each machine brand to program other machines from different manufacturers, so the company researched the market for software that could drive a wider range of brands and technologies. Burghard came across JETCAM from the dealer, Blechwelt, that offered a system that was simply and logically built so that new co-workers understand the system easily in a short period of time. The company could buy any brand of machine without having to worry about the programming process. It could just simply order a new post processor, and nests could be running on a Trumpf Laser and on a waterjet with a mouse click. As newly purchased machines became more complex, the software was adapted to take advantage of the new features. A fully automated Trumpf Trumatic 6000L with SheetMaster could be controlled with the same precision and ease as the previously manually loaded TC500. A problem with the Bystronic Bystar, with its proprietary software, was solved by purchasing a postprocessor from Blechwelt so that all of the company’s machines could be programmed by each of the two programmers. Götz keeps their systems up-to-date through purchased updates, and any programmer can control all the machines with the same quality. New people to CAD/CAM programming can be trained in-house and be up to speed in an extremely short time. Burghard says when the company needed assistance, it was readily available. For new machines, they simply purchase a new postprocessor and have staff trained on how to program for any new features. The interfaces to 3D CAD system are kept up-to-date through regular updates and technical questions and problems are resolved quickly between the programmers with Blechwelt’s technical support. Goetz runs JETCAM Expert Premium on three Trumpf lasers, a Bystronic laser and a Foracon waterjet. The key benefits of the JETCAM are: replacement of three CAM systems with one easier interface, the staff can program all machines, new machines can be programmed just by adding a new postprocessor, all existing geometry and nest files can be immediately programmed with new postprocessors, and fast technical support for any issue. JETCAM International s.a.r.l. has been developing and distributing its JETCAM Expert range of CADCAM in over 80 countries worldwide where it supports virtually every CNC punching, laser, plasma, routing, waterjet and flatbed cutting machine available today, allowing users to program any combination of CNC machines with a single CAM system. JETCAM International s.a.r.l. has released an update to its free CAD Viewer supporting all major 2D CAD formats. The application is lightweight, requires no registration to download/use and does not need any CAD applications to be installed in order to view the files. 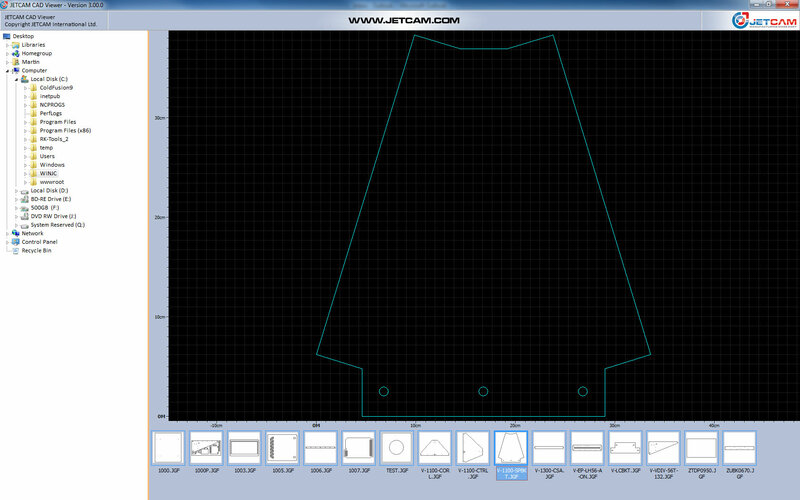 The JETCAM CAD Viewer supports 2D DXF, DWG (including AutoCAD 2013), IGES and JETCAM component files, and can view files located either on the user’s PC or across a network. Thumbnails are displayed in a scrollable ‘component tray’ at the bottom of the screen. The main area displays the CAD file, with a ruler left and below. The image can be panned by left clicking and dragging, and the scroll wheel provides zoom in/out functionality. Users can also use the keyboard to tab between the file explorer and component tray.